I want to set up a Bluetooth link between devices that are over 2000 feet apart. Yagi antennas for 2.4GHz that can connect to routers are available. 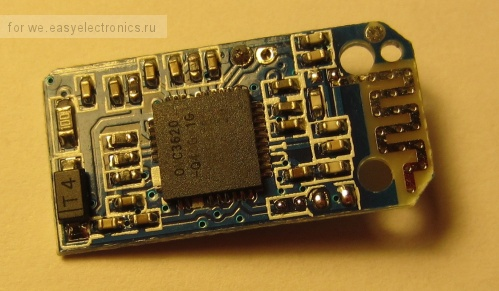 A cheap Bluetooth dongle that can be easily taken apart can be found on DealExtreme (see the insides of one at http://we.easyelectronics.ru/Stress/prikruchivanie-usb-ustroystva-k-vnutrennostyam-noutbuka.html [In Russian] ). The cheap Bluetooth dongle has an antenna on its PCB. How can the internal antenna, with its single wire connection, be disabled and the external Yagi, with its coax wiring, be connected for strong signal strength? This is an example of the type of dongle I'd like to modify. The antenna trace can be seen on the right side of the PCB. A Yagi antenna for bluetooth may increase your gain. Keep in mind that Yagi antennas are directional antennas so if you move your target around you will have to move your antenna. Use a coaxial cable with the same impedance as your antenna and your final amplifier at bluetooth end. Try o match the feed point impedance and the impedance at source by minimally separating the coaxial conductors (center and shield) at either end. Make sure you account for signal loss in the co-axial cable. Use a better cable if you want to reduce the loss. It won't work. Not at 2000 feet/600 meters. While @ChetanBhargava gave excellent advice on how to hook up the external antenna, and that will provide a noticeable boost, bluetooth devices are not designed for the amount of radio power you need. A normal bluetooth device comes in 1 of 3 classes. Class 3 device, the weakest, have a max rf power output of 1mW, with a ideal range of 1m. Class 2 devices have a max power of 2.5mW, with a ideal range of 10m. Class 1 is the strongest, with 100mW of power, with an idealized range of 100m, in perfect line of sight conditions. And that's only with a good transceiver. In a perfect system, with the best antenna and perfect transceiver, you would still not get the 600m range you want. Those cheap bluetooth modules are just not going to have a quality high power radio transceiver needed. There are non-standard devices that can communicate over 1000m, but you won't get them for five bucks. Bluegiga - WT41 Long Range Bluetooth Module or XRange2000. Not the answer you're looking for? Browse other questions tagged connector bluetooth antenna impedance gain or ask your own question. What technique can I use to focus a Bluetooth 4 transmission (or at least shield it)? Cheapest, simplest way to implement a Bluetooth keyboard/mouse? Why I got very weak signal with my GSM antenna connected to PCB? How can I plug my homemade Yagi Antenna into a wifi USB dongle? adding an antenna to a toy PCB, where can I ground it? is the negative battery cable ok?